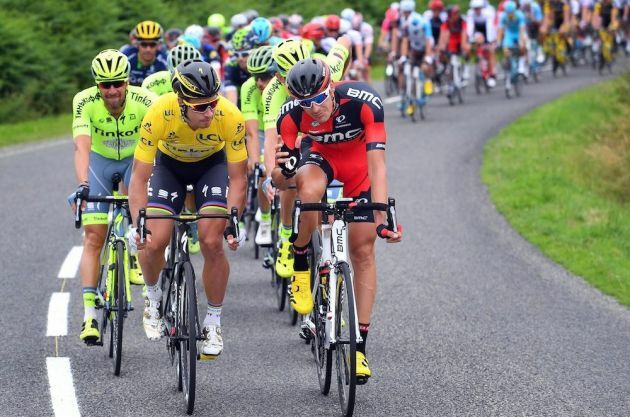 Road: Third stage of the Tour de France offered a big bike fest when the cyclists thundered out of some of the pavésektionerna used in the Paris-Roubaix. Thor Hushovd (Cervélo Test Team) was in the lead at all times and in the HomeStretch, it was no doubt about it. The Norwegian crossed the finish line first of all after a relatively simple Sprint against Geraint Thomas (Sky Professional Cycling Team). The third stage of the Tour de France offered a big bike fest when the cyclists thundered out of some of the pavésektionerna used in the Paris-Roubaix. Thor Hushovd (Cervélo Test Team) was in the lead at all times and in the HomeStretch, it was no doubt about it. The Norwegian crossed the finish line first of all after a relatively simple Sprint against Geraint Thomas (Sky Professional Cycling Team). – For me it was this stage perfectly, I was motivated when I like the pavé. It was like a mini-Roubaix. I have had this stage in the tank for a long time. I’m really excited for this. The team did a great job, “said Thor Hushovd as with today’s victory is now up in the eight stage wins in the Tour de France. It was the King of pavé, Fabian Cancellara (Team Saxo Bank), who created the crucial group as he walked up in front of the main peloton on the pavésektionen Sars-et-Rosières.Shortly after the Swiss passed up in the lead came Fränk Schleck (Team Saxo Bank) error in a turn and went into reverse. The peloton bursting up and Fränk Schleck was left in the ditch with a broken collarbone. Geraint Thomas, Cadel Evans (BMC Racing Team), Thor Hushovd and Andy Schleck was the only one who managed to keep up with Fabian Cancellaras rampage. As Fabian Cancellara got Andy Schleck and competitors like Alberto Contador (Astana) and Lance Armstrong (Team Radioshack) lost the plug it was full gas from multiple tempo world champion to win time for Andy Schleck. Ryder Hesjedal (Garmin-Transitions), which appeared in today’s big breakout ran cruelly strongly ahead in the lead. He asked of his breakaway colleagues and struggled against the group with Evans, Cancellara, Schleck, Hushovd and Thomas on their own. Only when it was just over two kilometres left to the finish, he was captured. Behind the dense group was full of drama for several of the Favorites. Lance Armstrong, who for a while was the closest behind the Cancellaras group, punctured the front wheel and was after. He then rip the evil to get back to the group that Thomas Löfkvist (Sky Professional Cycling Team) put in. From the same Group succeeded in including Alberto Contador and Bradley Wiggins (Sky Professional Cycling Team) go away before American hooked and shortly thereafter when the finish line was close was also Thomas Löfkvist unleashed in a smaller group. The Swede ran strong throughout the day, was at the forefront of the early pavésektionerna and it did not appear at all that it was the first time he competed on this difficult pavé. The shape is good at was. The tough stage harvested their victims and worst thus went for Fränk Schleck who was forced to break the tour but also riders like Ivan Basso (Liquigas-Doimo), Alberto Contador, Carlos Sastre (Cervélo Test Team) and Lance Armstrong lost the important time in the abstract, especially to Andy Schleck and Cadel Evans. Sylvain Chavanel (Quick Step) who won yesterday’s stage and ran in the Jersey did not have a favorite today over cobblestones. He suffered two punctures and rolled into the goal almost four minutes after Thor Hushovd. Thus he lost his leader’s Jersey which was recaptured by Fabian Cancellara.